This Easter why not try making your very own Easter egg. 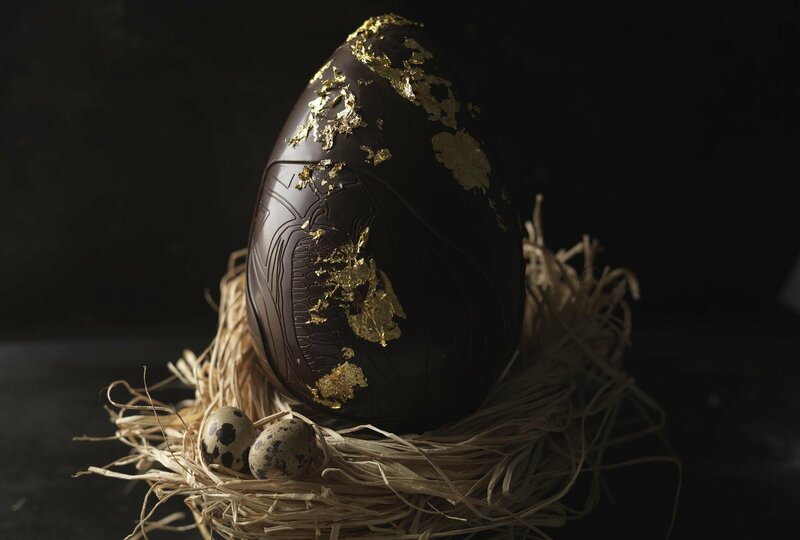 Choose the type of chocolate you use carefully as it will make a big difference to the shine, snap and taste of your final egg. We recommend using couveture chocolate as this guarantees the appropriate purity and percentage of ingredients. Line a tray with parchment paper. To sterilise the mould place a pan of simmering water on the stove. Hold the mould over the steam for about 1 minute or until coated with steam. Using a fresh cotton wool ball buff off the moisture. Using more cotton wool buff over again to polish the mould. Place the polished mould face-down onto the paper lined tray. Repeat with the remaining mould. Using a clean dry pastry brush paint on the tempered chocolate to coat the inside of the mould. Take a ladle and pour the tempered chocolate into the mould to coat the entire surface. Turn the mould over, and pour out the excess chocolate into the tempered chocolate. Tap gently with a spatula to help the chocolate run fluidly and remove any air bubbles. There should be a coating of chocolate in the mould. Place the mould on the paper lined tray flat side down and allow to set at room temperature for 10 minutes. When the chocolate has started to set and stopped dripping, scrape the chocolate excess away from the rim of the mould with a knife so that it finishes neatly at the top edge of the mould (this will allow it to contract when refrigerated). Repeat with a second ladle of chocolate to build two layer of chocolate. Continue this process on the second mould. Refrigerate moulds to fully harden, about 30 minutes. When fully hard the chocolate egg halves should release easily from the mould onto the tray. If required gently tap on the outside of the mould with a spoon to help release them. Secure the 2 halves together by quickly applying a thin layer of some of the remaining tempered chocolate around the rim of one of the egg halves using either a piping cone or a cocktail skewer. Then immediately place the other egg half against it so that they line up and stick together. To secure the egg in a standing position, place the remaining fluid tempered chocolate (about 1 tablespoon) onto a piece of parchment paper to form a mound approximately 7 cm in diameter. Wait until the chocolate begins to show clear signs of setting and becomes dull on the edges. Align the rounded part of the assembled egg onto the centre of the chocolate mound. Press down firmly to attach. Support while the chocolate continues to set and fully harden. Move the egg onto a presentation board or plate. To attach random sheets of edible gold leaf brush the area to be covered with a little runny honey, then press the gold leaf against it. Wrap raffia around the base of the egg to disguise the join between the egg and the base piece. Dark chocolate is always quite challenging to match, especially when the cocoa solids are very high. The bitterness of the cocoa normally clashes with the acidity that is usually present in a well balanced dessert white wine. Red dessert wines possess the advantage of having not only a slight sweetness but also tannins that can complement the bitterness of the chocolate harmoniously. Easter is time for celebration and there is nothing better than bubbles to help us to celebrate. Therefore a sparkling red wine could be the answer here! The most famous and suitable contender for the job is a sparkling Shiraz from Australia. The Black Queen 2010 vintage from Peter Lehmann in the Barossa is textbook: full bodied, rich, smooth, and chocolaty in its own right and will be the perfect partner of our homemade egg. If sparkling Shiraz is out of question, a young Ruby Port should do the trick. For extra thrill, you can even try to open the bottle of fizz with a sword! Happy Easter!